Percy Wyfold Stout was born on 20th November 1875 in South Hamlet, Gloucester, the third son of William Stout and Emma (née Adcock). His father was a leading amateur oarsman, who won the Diamond Challenge Sculls at the Henley Royal Regatta and the Wingfield Sculls on the Tideway in 1868, two of the top single sculling events in the UK. He was director of the Iron and Hardware Company Ltd, and ran an ironmonger’s shop in Westgate Street, Gloucester. He gave his sons middle names related to rowing, hence Wyfold after the Wyfold Challenge Cup at Henley. As a boy, Percy lived in Barnwood and was educated at the Crypt Grammar School, where he took up association football, which he continued to play for Gloucester, Wickwar and Corinthians. During the 1892-95 seasons he made 67 appearances for Gloucester City and scored 44 goals, and was the outstanding player in the early years of the Club, being the first player to score 20 goals in a season and slotting four in one game against Bristol Rovers. He was also rated the best player in the Gloucestershire football team, playing for them against some of the top sides in the country including Wolverhampton Wanderers, Aston Villa and Blackburn Rovers. He suggested the formation of a Bristol & District League, which was set up in 1892. He was also a gifted cricketer for the Gloucester City club. Around the age of 20, during the 1895-96 season, he took up rugby with his younger brother, Frank, and they both quickly adapted to the handling game. His representative appearances that season included six more County caps against Midland Counties (won 8-5, one conversion), Cornwall (won 16-3, one try and two conversions), Devon (0-0 draw), Somerset (won 7-3, one try and one dropped goal), Devon (lost 0-3), and Surrey (drawn 5-5, one conversion). He, and his brother, again played in two England trials for the South against the North, the first at Bristol on 17th December 1898, which was won 6-3, with Percy dropping a goal from a penalty and Frank scoring a try, and the second at Newcastle on 25th February 1899, which was won 11-0, with Percy kicking a conversion. 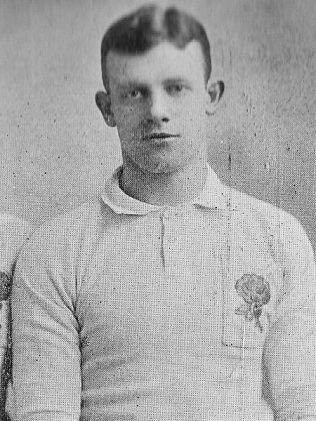 Percy won three further caps for England, but for this season he was switched from wing to centre. The first was the only occasion on which Percy played for England without Frank alongside him; it was against Wales at Swansea on 7th January 1899; the result was a heavy loss, 3-26. Unlike many of his teammates, Percy retained the faith of the selectors for the next fixture on 4th February 1899, but England lost again – it was Ireland 6 England 0 at Lansdowne Road, Dublin, in front of 25,000 spectators. On 11th March 1899, Percy played in his final international, England 0 Scotland 5, at Blackheath. The Committee of the Gloucester Football Club presented Percy with a case of pipes and a silver cigarette case, inscribed with “Presented to Mr Percy Stout by the Committee of the Gloucester FC as a sincere token of their regard for him and appreciation of his services to the Club. Oct 1899”, and formally placed an entry in the Club minutes “The Committee desire to tender to Mr Percy Stout their thanks for the valuable services he has rendered to the Club, and their sincere wish that his future career will be a happy and prosperous one.” His fellow players gave him a silver-mounted cigar case inscribed, “Mr Percy Stout. From the players of the Gloucester FC. Oct 1899. Auld Land Syne”, before he left England on 20th October 1899 to become a stockbroker in Cairo. He did return to Gloucester for Christmas 1900, and made one final appearance for the Club in their Boxing Day fixture, a 0-0 draw against Old Merchant Taylors. He finished his Gloucester career with 65 appearances, 28 tries, 57 conversions, six penalties and five dropped goals, totalling 236 points. For the County he won 13 caps, and scored six tries, eleven conversions and one dropped goal. He won five caps for England and played four times for the Barbarians. After leaving Gloucester, Percy played for Richmond and Bristol, but he was to live most of the rest of his life in Egypt. Initially he was a partner in Hogg and Stout, stockbrokers and agents de change in Cairo, but in 1907 his partner died and Percy bought out his share of the company, and became Managing Director of the Cairo Exchange Ltd. He married his American wife, Mary, in Egypt. The Great War brought him back to this country, where he was commissioned as a Second Lieutenant in the Cavalry Reserve before being transferred to the 20th Hussars in September 1914, and then to the Royal Naval Air Service [RNAS]. He landed in France in May 1915, and was promoted to Lieutenant and subsequently Captain, but left the RNAS to take up a commission in the Army in October 1915. He was assigned to Egypt and for a while worked for the Intelligence Department in Cairo. He moved to the Motor Machine Gun Corps on the Western Front, and won the Distinguished Service Order [DSO] for gallantry on 16 August 1917 whilst serving in the Machine Gun Corps – the citation read, “T/Lt (A/Capt). Percy Wyfold Stout, MMG Corps. For conspicuous gallantry and devotion to duty. At a critical moment, when a number of armoured cars were in danger of being cut off, he led the attack to their relief, and after two hours’ heavy fighting gained the objective, after inflicting heavy losses upon the enemy.” He spent a period with the rank of Captain on the staff at General Headquarters [GHQ]. Percy was also Mentioned in Despatches five times, and was awarded the Officer of the Most Excellent Order of the British Empire (Military Division) [OBE] for valuable services rendered in connection with military operations in Egypt. After the war he returned to Cairo, and in 1919 His Highness the Sultan of Egypt conferred on Percy the Order of the Nile (4th Class), Egypt’s highest state honour, awarded for exceptional services to the nation. Percy was employed as a director of the Egyptian Delta Land Co and the Anglo American Nile Co Egypt. He still returned to England on occasion, and in May 1932 Percy and his wife did so aboard the SS Sibajak, sailing from Port Said, and giving their permanent residence as Egypt and their temporary address as 46 Clarges Street, London. Percy died on 9th October 1937, aged 62 years, and is buried in Hampstead Cemetery, London. Percy Wyfold Stout was my grandfather and I am very proud to be discovering more and more amazing facts about him and his brother Frank.